Most people think fall is about endings, but that’s not entirely true. The mini-season I think of as “fall-spring” has begun. It comes in September, after a few good rains and before any real cold weather. Like true spring, it’s a time of relief after a period of stress. There are fall-blooming bulbs — autumn crocuses, colchicums (such as the ones in the photo) and nerines. Many perennials persist in blooming, especially if they have been deadheaded or cut back (good old Linaria, for example, and Lychnis coronaria whose bloom stalks were cut down by half in July). Others bloom for the first time in fall (asters and plumbago (Ceratostigmata plumbaginoides). Shrubs and vines whose main flush of bloom occurs in spring often rebloom a little now — rhododendrons, magnolias and Clematis armandii. 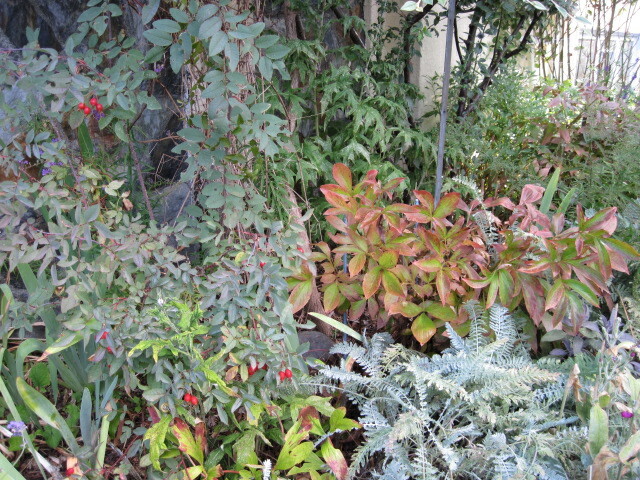 More subtle are the changes in foliage colours. I don’t mean the spectacular autumn colours of trees. Long before they begin to change, the foliage of certain perennials and shrubs shifts from summer green to shades that are almost magical. 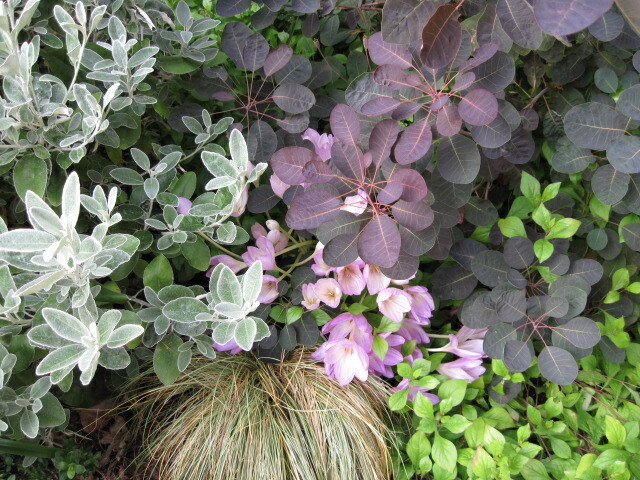 The smoke bush (Cotinus), both the purple and green-foliaged forms, develops intensely orange, yellow and purple spots on its leaves that transforms each one into a tiny work of art. Peonies, both herbaceous and tree varieties, acquire flushes of apricot and magenta that make them glow, especially near grey-leaved plants. The refreshment of rain and coolness, combined with the lower angle of light that comes with the changing season, bring about a transformation of the garden from its dry and dusty late summer state to a dying vitality, a final glory before the end of the main growing season. Maybe it’s because of my obsession with drought (actual, imminent or potential) in our Mediterranean climate here in climatically fortunate Victoria, B.C., but this is my favourite time of the gardening year. I have laid down the watering can and abandoned the hose. The struggle to grow a decent vegetable garden is over once again. I can wander the garden, enjoy the lingering blooms and plan for next year. A book that celebrates this season is The Garden in Autumn by Allen Lacy. Drawing on his own experiences, he discusses fall-blooming perennials, bulbs, annuals, shrubs and ornamental grasses. I recommend it.